I’m an old school video gamer from way back in the day. For most of the 80s, all I had was an Intellivision, mostly because my dad was glacially slow at adopting new technologies. We didn’t get a CD player until 1994. I first got an NES sometime in 1990, I believe. It was around the time that Nintendo Power was running that Dragon Warrior promotion. Anyways, the games on the Intellivision system could best be described today as “crude” but immensely fun. Even today, I could probably still kill a bunch of hours playing SNAFU or Triple Action, provided I had decent human competition. All that being said, while today I game mostly on my PS3, I still have an appreciation for the original home gaming consoles. That appreciation also extends to TRON, which was a groundbreaking film in 1982, but is mostly considered “adorably simple” in today’s CGI world. While I still love TRON, every time I re-watch it, it gets a little less great in my view. Some of the visual effects are still decently impressive, but it isn’t the cyberpunk classic that I want it to be. A lot of the acting decisions by the cast could best be described as “laughable at best”, and the director Steven Lisberger would probably have done a few more takes if the film wasn’t such a relatively expensive movie to make. Jeff Bridges and David Warner are pretty great from start to finish, but the rest of the cast just doesn’t seem to know what the hell is going on for the most part. 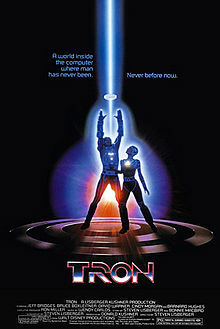 I’m not one for re-editing movies and changing certain aspects of them for modern audiences or anything, but I would like to watch a version of TRON that was scored by Daft Punk. They did such a good job with TRON: Legacy that I think they could certainly improve upon the very dry and – at points – highly annoying synthesizer score of TRON. I still greatly enjoy TRON, but it isn’t one of those films like The Big Lebowski where you gain a further appreciation for it each time you see it. The Blu-Ray transfer looks great, though, and though many may decry the effects as “quaint”, I still think it’s a visually stunning movie.